With a fast metabolism, Christmas pudding, custard and ice cream should be able to be enjoyed and NOT result in extra kilos and centremetres on the waistline! Life, food and Christmas time should be enjoyed WITHOUT the constant stress about what to eat and what the scales will do. If metabolism is fast, mince pies, and candy canes can be consumed and metabolised WITHOUT weight gain. HOW DOES METABOLISM SLOW DOWN TO START WITH? Long periods of low calorie eating, low carb diets, not enough nutrients, high stress, or excessive exercise will DOWNREGULATE metabolic rate. This can result in fat gain whenever a little extra is consumed. This can cause issues for those with slow metabolisms around Christmas time, when Christmas festivities and food result in the scales going up. PRO-METABOLIC NUTRITION MEAL PLAN PROGRAM. WHY DO SOME PEOPLE GAIN WEIGHT SO EASILY? 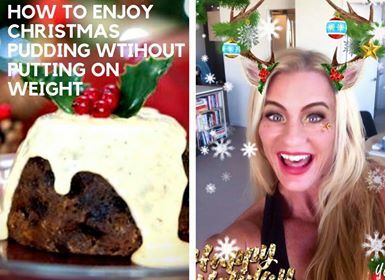 When a low calorie, nutrient deficient diet is eaten, metabolism slows down and it is SO EASY TO PUT ON WEIGHT – just a few candy canes or a mince pie and…boom…. up it goes. Quite simply, if the body is in a state of starvation or it is deprived of calories, it can conserve every bit of energy. The body is very clever and is designed to survive. When feeling starved, it begins to slow down certain systems to conserve energy. The systems affected are the immune system, hormonal system, detoxification system, digestive system, nervous system, fat loss system and reproductive system. In addition, a slow metabolism leads to cold hands and feet, reduced energy, poor sleep, increased weight gain, hormone imbalances, dry skin, feeling blah or down and a host of other symptoms. THE SOLUTION IS NOT ANOTHER DIET!! The solution is NOT to go on another diet. This will just increase metabolic issues and may result in a further slow down. Instead, the best approach is to improve metabolism, improve health and create hormonal balance. HOW DOES PRO-METABOLIC NUTRITION WORK? Pro-Metabolic Nutrition is based on the research of leading endocrinologist Dr Peat and is designed around eating foods that increase metabolic rate and thyroid hormone production whilst avoiding food and lifestyle factors that slow it down. Fat loss favours a fast metabolism. I support a nutritional philosophy and principles to create a great looking, healthy and hormonally balanced body. Eating MORE food means I no longer have to worry about the scales at Christmas as my body is healthy and burns fat and food easily. PRO-METABOLLIC MEAL PLANS TO INCREASE METABOLIC RATE. Spend 6-8 weeks boosting metabolic rate (many get leaner throughout this stage), then the body is optimised for a super boosted 4-6 weeks of fat loss. Plan contains delicious and nourishing food. ← SIMPLE FOODS TO EAT FOR BETTER RESULTS IN THE GYM.